When a game glitches, is it broken—or just opening a door into an unexpected new game? The free Windows game Pause Screen from Battletoads suggests the latter. It's hard to say too much about it without spoiling the fun, since as its creator Z. Bill says, "The point of the game is figuring out how to play." 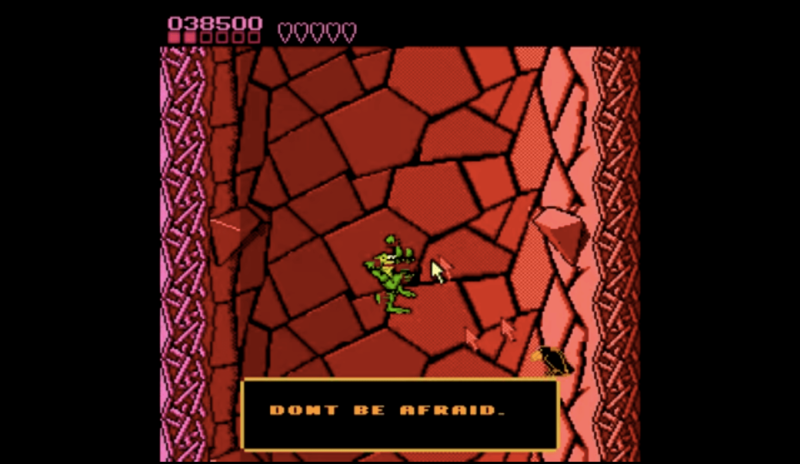 At first, you're falling through a famous level from the classic NES game about giant fighting frogs in an endless loop. But after a few moments, a message appears, telling you to pause the game. And that when the real game begins, as your manipulations start to create increasingly strange and interesting glitches. While you're not really breaking Battletoads to explore its innards—aka glitch hiking—it's designed to make you feel like you are. Aptly named Pause Screen from Battletoads, the game was created for the Idle Thumbs Wizard Jam, and is available for Windows users only. You can download it for free, or watch a playthrough below in about five minutes. That'll spoil the surprises, though, so try it yourself if you can.